“Who wants to be spending time organizing your go club when you could be playing go?” asked Santa Fe go club organizer Robert Cordingley Monday evening. 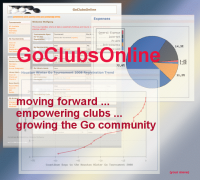 Cordingley conducted a presentation on his online software GoClubsOnline, which simplifies the process of registering players for tournaments, sending email to club members, uploading data to the AGA, tracking a club library, and more. Clubs can register with GoClubsOnline for $95/year for up to 30 members, though Cordingley is offering a discount for the duration of the Congress to $80/year for attendees.